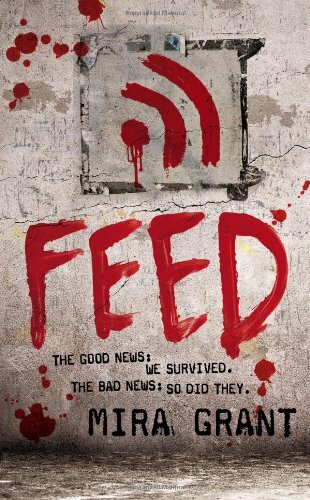 Feed is the first book of the Newsflesh trilogy by Mira Grant. The year was 2014. We had cured cancer. We had beat the common cold. But in doing so we created something new, something terrible that no one could stop. The infection spread, virus blocks taking over bodies and minds with one, unstoppable command: FEED. NOW, twenty years after the Rising, Georgia and Shaun Mason are on the trail of the biggest story of their lives-the dark conspiracy behind the infected. The truth will out, even if it kills them. I went into Feed expecting it to be awesome, and I was completely disappointed. I did enjoy the pop culture zombie references and the science behind the zombies, but these small pleasures were not enough to carry me 400 more pages. Given the cover, the title, and the reviews I've read, I expected a lot more zombie out of this zombie book. 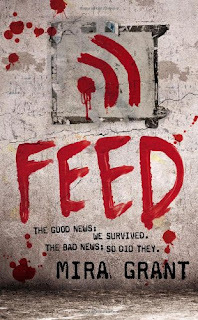 Feed is actually a YA political thriller with a zombie apocalypse backdrop. The lack of zombie wasn't really the problem, though. Sophie Littlefield's Aftertime series had a serious lack of zombie for a zombie series, but there was plenty to love. I struggled to find much to love with Feed. George and Shaun are "newsies" - bloggers who have been selected to cover Senator Ryman's campaign. They are also non-biological adopted siblings. Even though they aren't blood related, they grew up together very much as brother and sister. Their relationship in Feed was not one that I enjoyed. Unfortunately, I didn't feel like I got to know any of the characters other than George and Shaun, and I just didn't like them very much. The Hollywood one-liners were too much to bear. If I hadn't been reading Feed for a read-along, I would have abandoned it at 65%. There is a unique twist toward the end of the book. If my heart hadn't already abandoned Feed, I may have had a reaction to it - good or bad. I encourage you to seek out other reviews. A lot of people loved Feed, and their reasons may resonate with you. I, unfortunately, cannot recommend Feed to anyone. Those are definitely criticisms others have made. I went in knowing a lot about the book and the world it's set in, so I'm sure that helped my enjoyment. I'm sorry to hear you didn't like it, though. I always appreciate honest reviews. I am not a huge zombie fan, myself. Good on ya for the honest review, Jennifer! Doesn't really sound like something I'd enjoy either. I had been pondering whether to read this book... But I wanted more zombie out of it! I thought there was more! If it's political thriller... not my cup. I think I'm going to stay away for the time being. But the LAST 300 made me buy the second one... I haven't READ it yet though! I'm sorry you didn't like it! I was poised to hate it after the first hundred or so pages but then devoured the rest. To be fair, I wouldn't put it at the top of my "favorite books" list, but I enjoyed what I thought was a unique perspective. Sorry you didn't like this one. I heard it was very political which is why I haven't picked it up yet. I'm still curious about it a lot of my friends have loved it but yeah it's not very zombie-ly haha. Alice - Thanks. I was all set to love it so I'm pretty bummed I didn't like it. Thanks, Lee! I hate writing negative reviews. I wish I could love absolutely everything I read. Ron - Yeah, it's political and kind of strange. You're welcome. Jayla - Check out some other reviews just in case. Other folks have found things to love. Brittany - I'm so glad to hear you loved the rest of Feed. Even though I obviously didn't, I still root for everyone else to enjoy it. Giselle - My expectations were way off for sure. I have been on the fence with Feed for a long time. Now after reading your review I am sure it's not for me. I have to be able to connect with my characters. Thanks Jennifer! Ouch, I hate having to write a review stating that I didn't like a book. It's so difficult. I love that you stated your reasons of why you didn't get into to it - thanks for the insight! Love the honest review. I've wondered about this one but it never really seemed like my cup of tea anyway.